Celebrating its first year as an independent 501(c)3 organization, local nonprofit Minding Our Business recently honored five New Jerseyans and two organizations at its 17th annual fundraising gala on Friday, November 15. Minding Our Business Award winners and leaders. 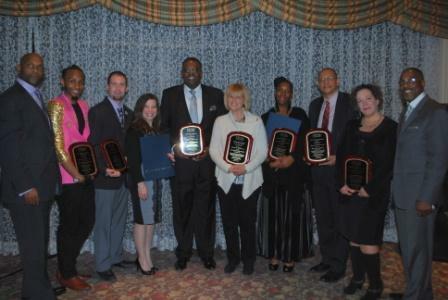 PRLog (Press Release) – Dec. 4, 2013 – Celebrating its first year as an independent 501(c)3 organization, local nonprofit Minding Our Business (MOB) recently honored five New Jerseyans and two organizations at its 17thannual fundraising gala on Friday, November 15. Close to 100 alumni, volunteers and donors attended the event, held at the Green Acres Country Club. “Minding Our Business began at Rider University with a passionate dream to instill business concepts and skills in local at-risk youth,” explains Kevin Wortham, MOB Co-founder and Executive Director. “Now that we’ve earned our independent nonprofit status, we are working hard to fundraise, friend-raise, and do all we can to broaden and enhance our entrepreneurship, academic and mentoring initiatives. Our vision is to become the leading model for service learning and summer learning in entrepreneurship for urban youth nationally! Having trained and mentored more than 2,500 Trenton middle school students in starting and running their own businesses since 1997, MOB currently operates three distinct educational and mentoring programs focused on entrepreneurship and experiential learning: 1) a 12-week after-school service learning program for Trenton middleschool students; 2) an intensive 2-week summer program at Rider University for low-income middle school students; and a 10-month advanced program providing business coaching to alumni seeking additional guidance. Each MOB program emphasizes business and entrepreneurship training, as well as math, reading, communication and life skills. · Parent of the Year:Cebrina Caryn Banks Eke, a Hamilton, NJ, resident who has served as a class mother and had all three of her children participate in the MOB program. · Tracey Syphax Spirit Award: John Harmon, a Trenton native and resident who is the current President and CEO of the African American Chamber of Commerce of New Jersey. · Elijah Foreman Spirit Award: Qaysean Williams, a Trenton resident who is a celebrity designer, fashion stylist and MOB alumnus. · Innovator of the Year: Dale Caldwell, a New Brunswick resident and current Head of School and Chief Executive Officer of the Village Charter School in Trenton. · Prime Supporters: Princeton Area Community Foundationand Sam’s Club, which are longtime MOB supporters. · Outstanding Citizen of the Year: Dr. Sharon Rose Powell, a Princeton resident, psychologist and MOB volunteer, and the founding President of the Princeton Center for Leadership Training (now The Center for Supportive Schools).